We happened to be in Duluth, Minnesota on the weekend when the Bentleyville Tour of Lights opened for the holiday season. The first shot was taken from the 5th street bridge just after sunset and before the tour was opened for the public. We had just watched Santa parachute into Bentleyville. As I was taking the photo a little boy, probably 5 years old, came running up and paused just long enough to shout that “I’m going to see Santa Clause” and then took off. About 20 seconds later a woman comes running by shouting “John wait for mom”. Fortunately she caught him before he reached the street. Since it was opening night it was more crowded than usual so it was a little difficult to get photos. In addition to the lights there is free popcorn, cookies and hot chocolate. If you are going to be in the Duluth area you should stop in to take in the lights. They are quite the site. There are more photos from Bentleyville on my website. A few weeks ago my wife signed up for a class on matting photographs. The class was being held at Beaver Creek Reserve which is just east of Eau Claire and right next to Big Falls County Park. It was a grey overcast day so I decided to drive her over for the class then drive over to Big Falls for some photography. 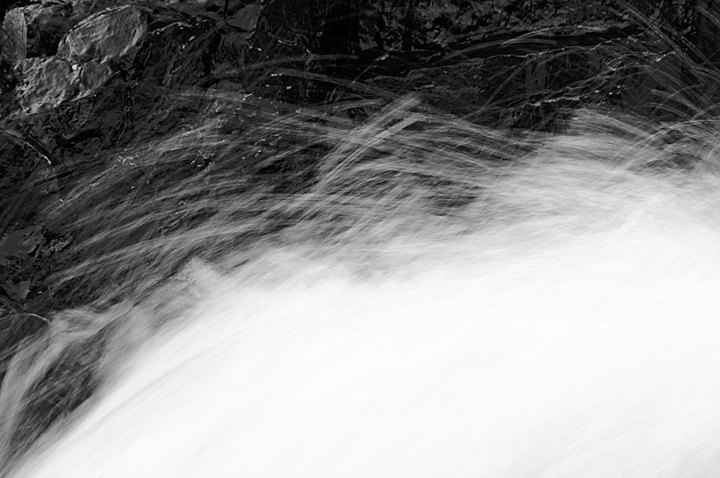 I normally photograph on the south side of the river because the falls on that side are much more interesting. 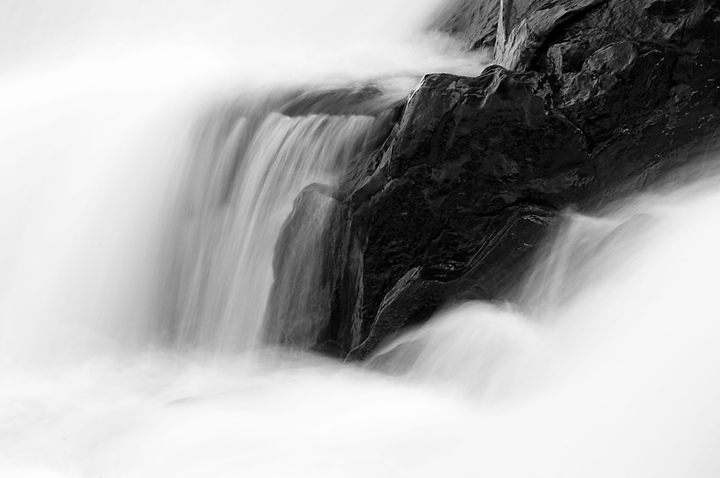 Since there is so much black rock around the falls and the day was overcast I decided to photograph in black and white. 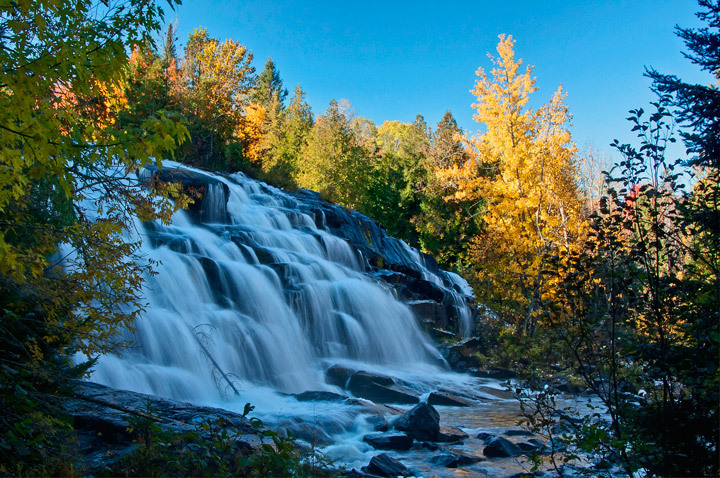 Although the name of the falls is Big Falls the reality is that it is a very small waterfall. 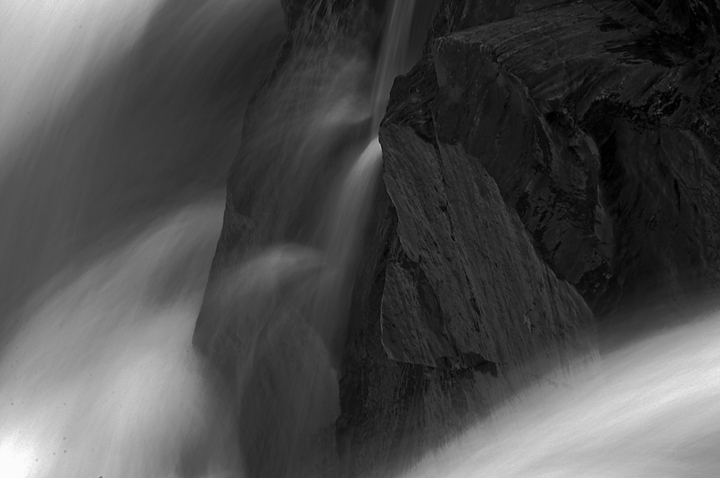 As a result I typically photograph small sections of it rather than the complete falls. 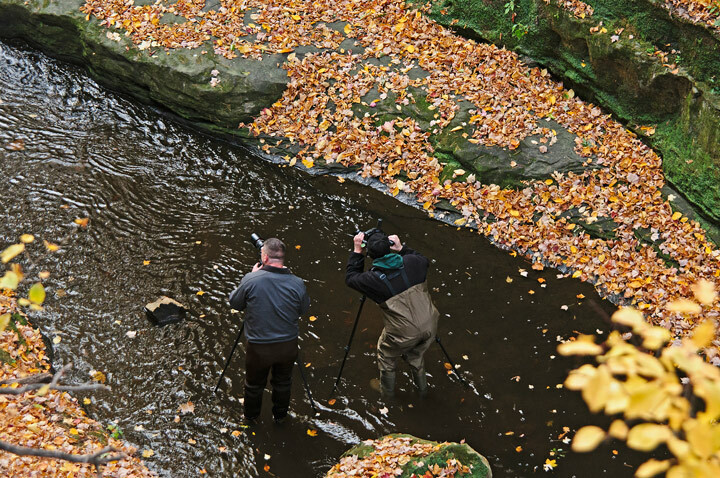 I’m always looking for different shot as the water levels change during different times of the year. 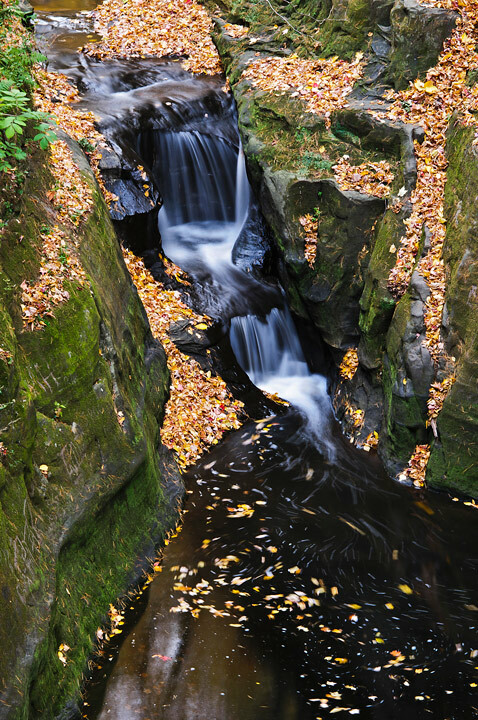 More photos from Big Falls County Park can be found on my website. A couple of weeks ago the evening temperatures dropped into the teens. 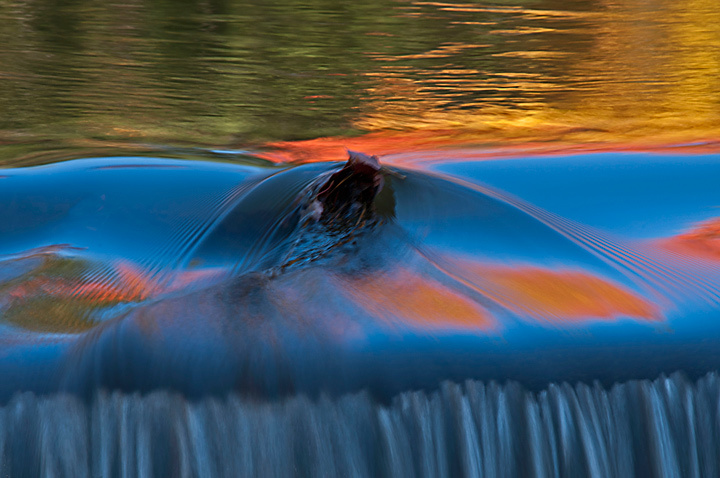 This was the signal to head down to Devil’s Punchbowl to photograph the first ice of the season. Normally I don’t photograph at Devil’s Punchbowl in the summer because there is just not enough to photograph but once the ice starts to form I’m usually there at least once a week. 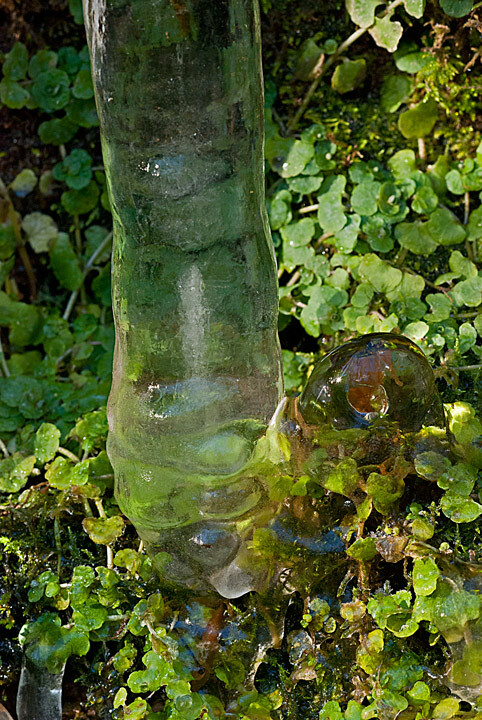 I was a little surprised at the amount of ice that had formed after only one really cold day. There were some significant icicles hanging from the walls in the bowl. 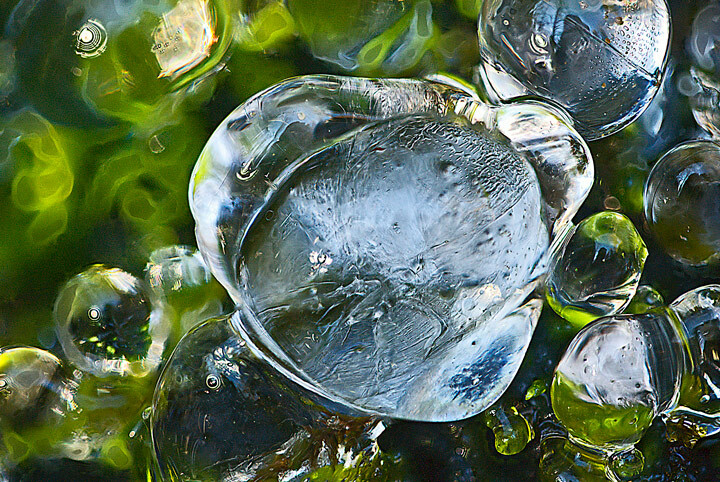 This time of year my main interest are the ice droplets that form around the vegetation at the bottom of the bowl. It’s always a little difficult to photograph the early ice because there is quite a bit of water dripping from the walls above. The ground around the base is usually ankle deep mud so knee boots are a must if you want to get close to the base. There was also quite a bit if ice falling from the wall as the day warmed. I usually try to get there around mid morning. 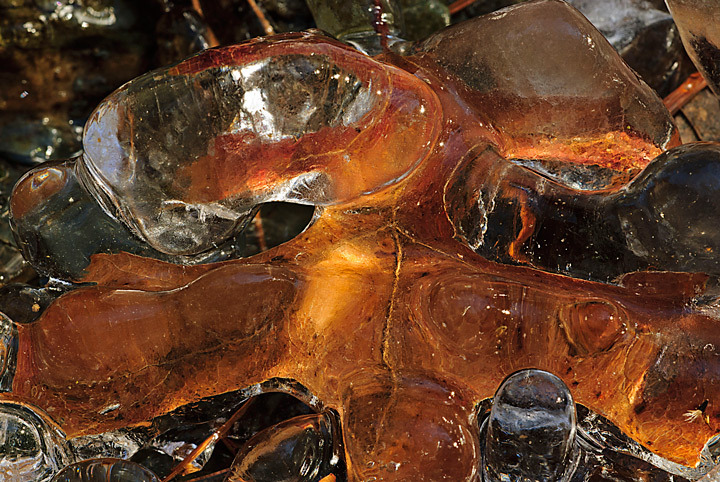 That gives me a chance to photograph ice that is in the sunlight and also ice that is still in the shade. After two cold days the weather warmed and the ice was gone. 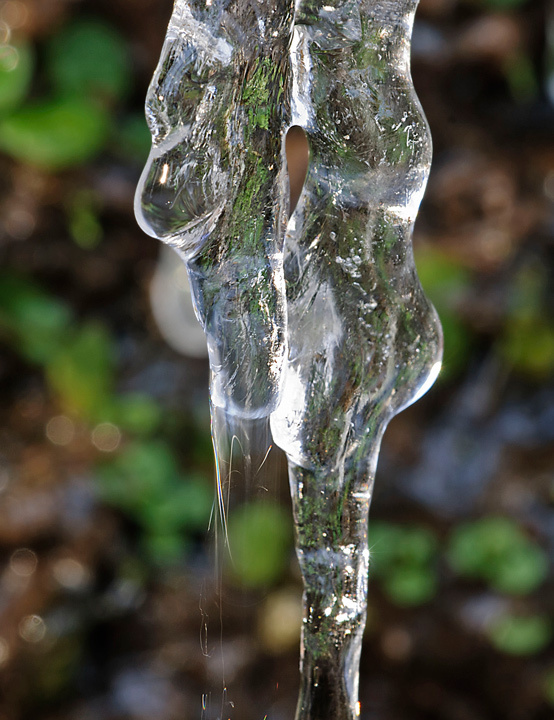 On the bright side the next cold snap will allow me to get more shots of the ice forming. 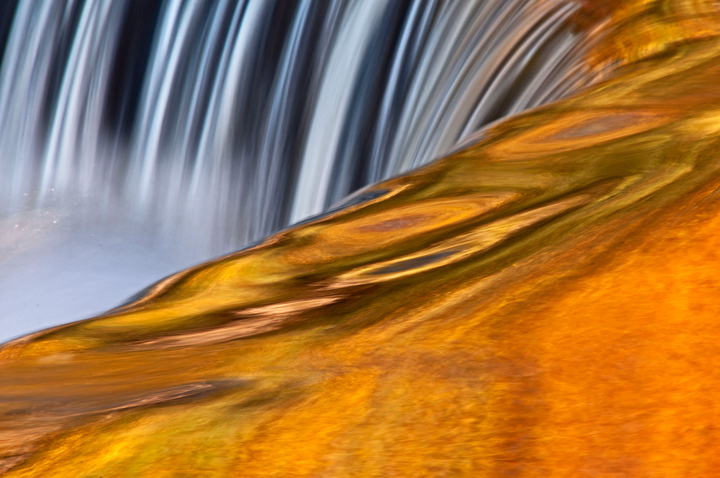 More Devil’s Punchbowl photographs can be found on my website. 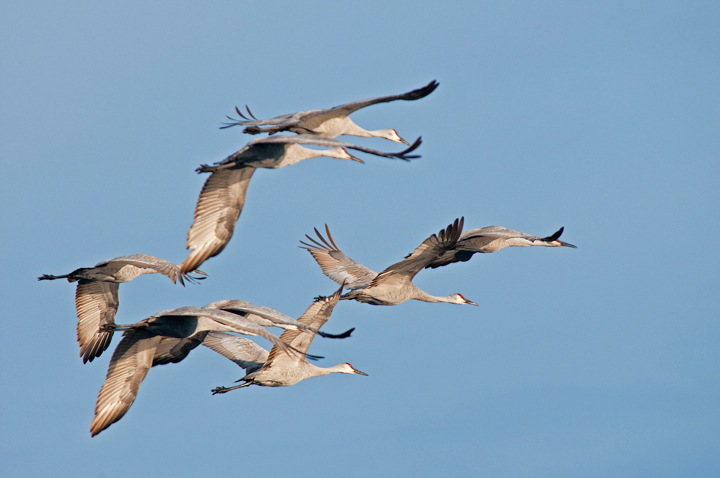 Fall means the fall migration on the Sandhill Cranes will be underway at Crex Meadows near Grantsburg, Wisconsin. 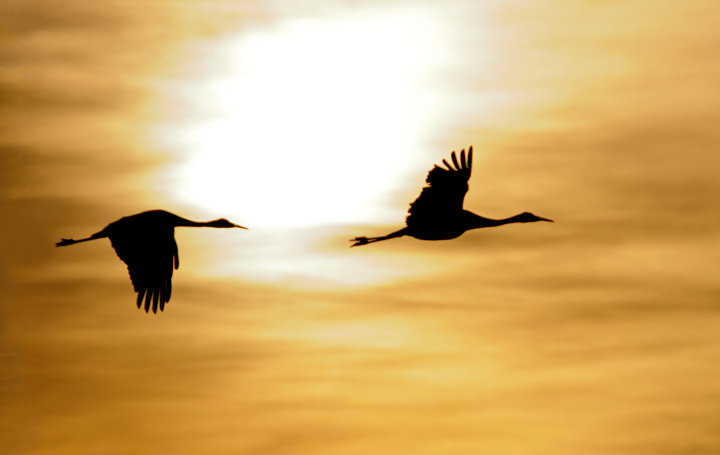 Thousands of Sandhill Cranes can be found at any one time around Grantsburg. 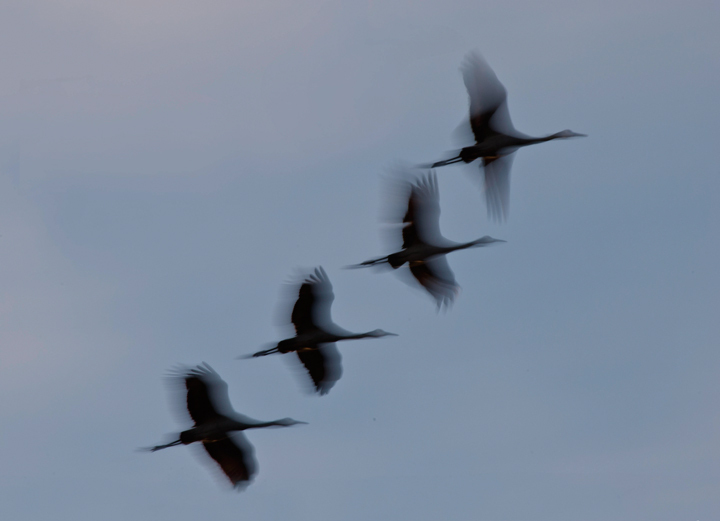 About an hour before sunset they all return to Crex Meadows, from their feeding grounds, to roust. Around sunrise they start leaving their roosting site to look for feeding grounds. It is a fantastic sight. 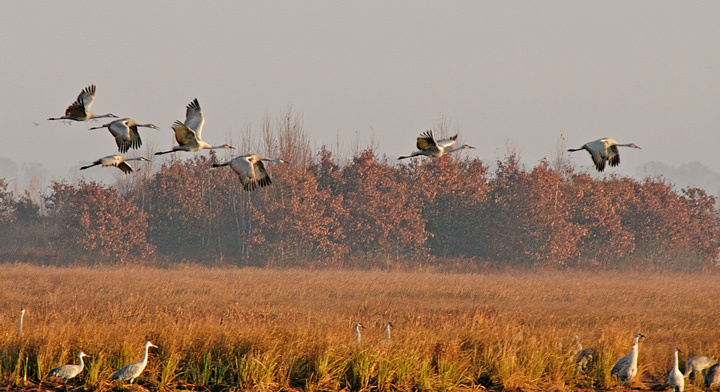 Here are a few photos from this years migration. 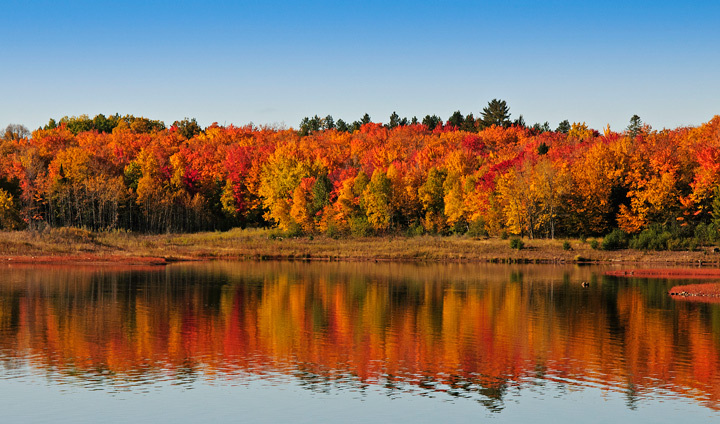 Now that the fall colors are done it’s time to reflect on my favorite fall photography location. Every year it turns out to be someplace different. This year it was Bond Falls. 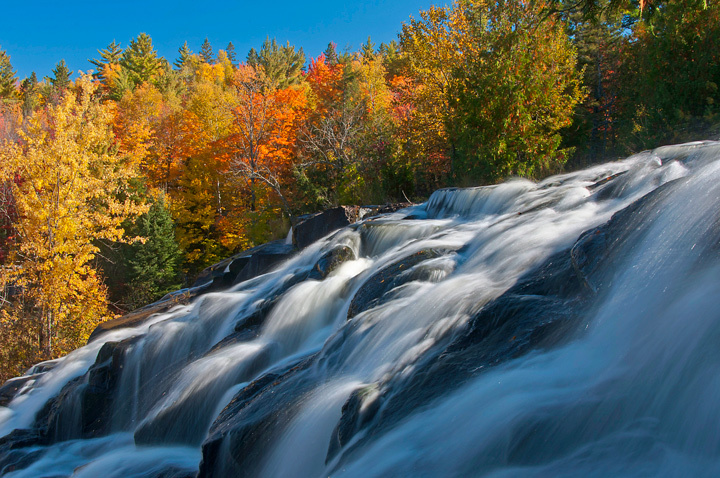 I’ve been to Bond Falls many times including several times in the fall but this is the first time I’ve managed to visit during peak color. 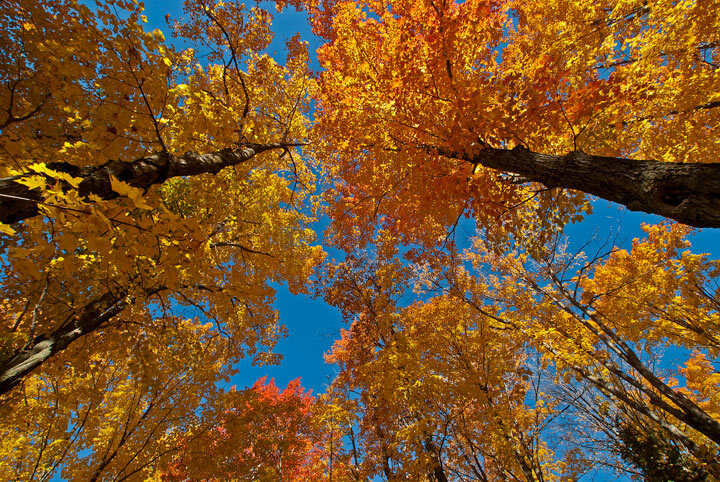 It turned out to be a spectacular day for photography and the best couple of hours I had this fall season. We drove in from Marquette, Michigan. Just before reaching the falls we noticed a camping area next to the lake that is the source of water for Bond Falls. As it has been for a number of years the lake was at a low level. 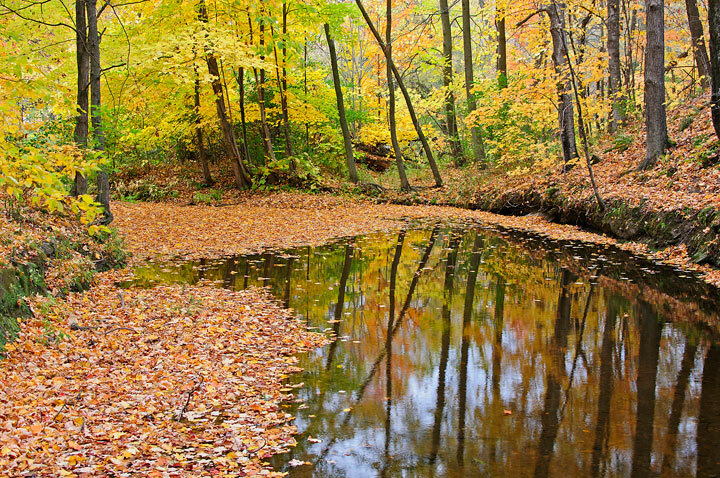 However there were some beautiful fall colors and reflections. We then drove down to the parking lot. I was a little surprised there were not as many people as I expected. Normally this time of year the place is packed. Nevertheless I did win a bet with my wife that we would see more than thirty people. She thought that on Sunday morning the place would be deserted. I won by a large margin. 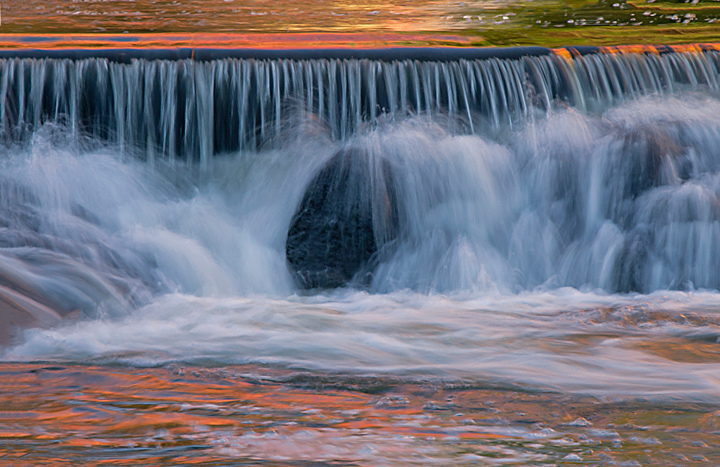 Time of day does make a difference when photographing Bond Falls. We arrived late in the morning when the sun was almost directly in back of the falls so it was impossible to get a good shot. 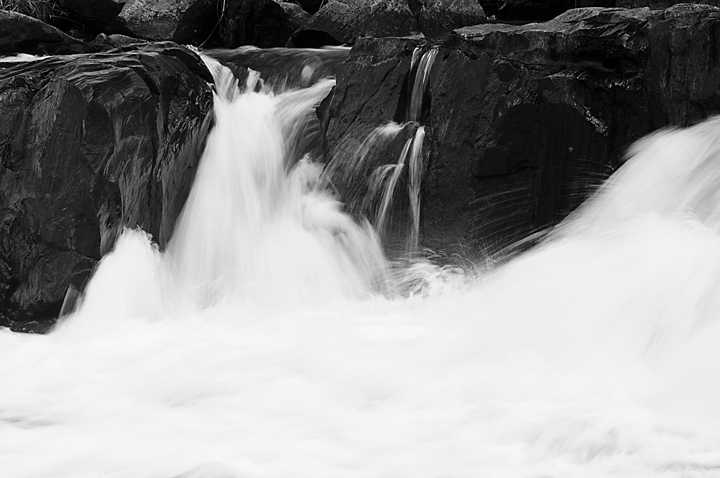 We walked across the footbridge at the bottom of the falls and I was able to get this shot. Because of the high dynamic range in the subject it was necessary to take several photos with different exposures and then merge them using Photomatrix Pro. This allowed me to capture the shadows and the highlights. In this case I used the Exposure Fusion option which gives you a more realistic product and one that is not obviously an HDR photo. We then followed the trail along the eastern side of the falls. It was difficult shooting because it was a bright sunny day. 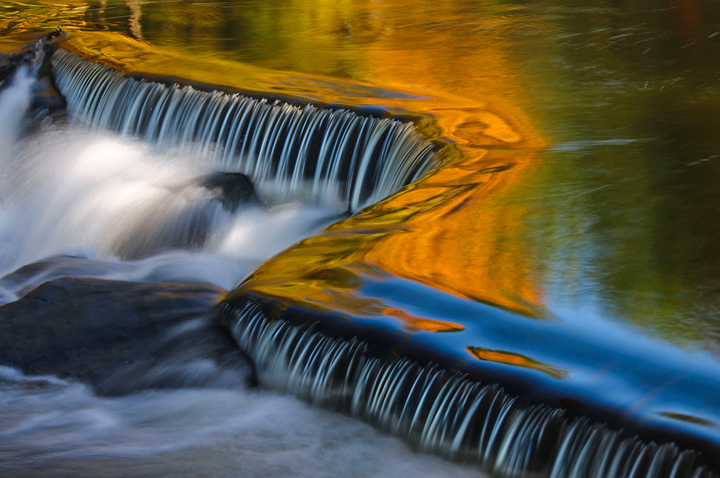 I did manage to capture a few reflection shots as well as this shot of a small falls. 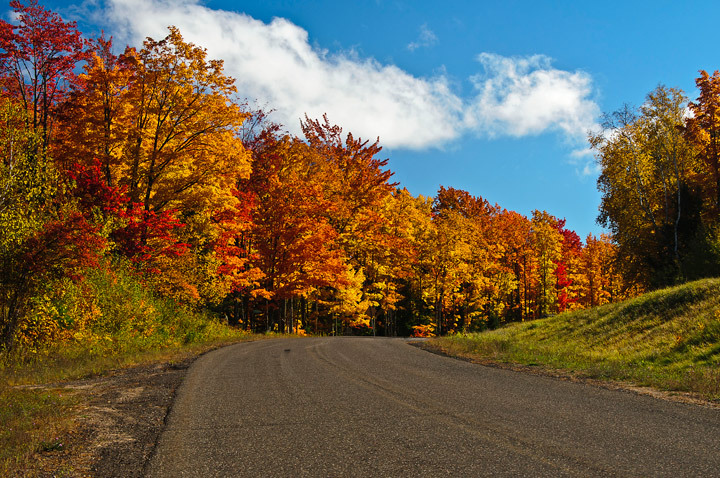 As we arrived at the road above the falls we notice some brilliant color in the trees along the road. This is the road that leads back to the lake above the falls. We then walked back over to the east side of the river to a small parking area. The water in this area pools a bit and I was able to get some great reflection shots of a small falls and leaves in the water. We then headed down the west side trail. Our main destination was the famous Z which is a popular photography location. I expected to stand in line for a photo opportunity but everyone walked past without even looking. Obviously they were not photographers. The next stop was the stairs at the head of the falls. Once again it was necessary to take several shots to capture the high dynamic range in the scene because part of the Falls was in bright sunlight and part in the shade. We stopped briefly at the bottom of the falls for a few photos then returned to the car for the long drive home. 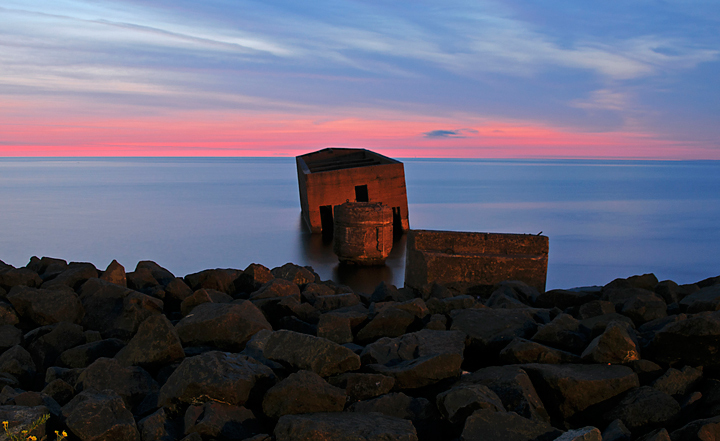 The Cribs are a major landmark along the Duluth, Minnesota waterfront. There are a number of stories regarding what the Cribs were but in reality it was part of a facility that was used to unload sand and gravel. Harvey Whitney, one of the Whitney brothers, felt that it would be much more efficient to unload sand and gravel outside the harbor because of congestion in the harbor in the busy summer months. At the time there was talk of building an additional breakwater outside the harbor which would have protected the structure. The Cribs were build in 1919 during a building boom in Duluth. The large cement structure you see was much further out in the lake. 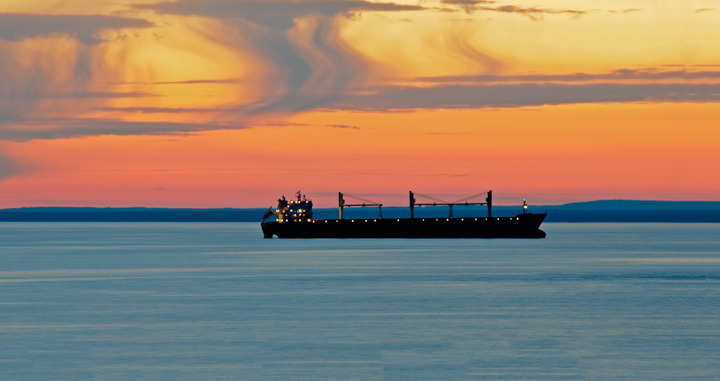 Sand was barged to Duluth from the Apostle Islands and Gravel from Grand Marais. the sand and gravel were unloaded out in the lake from a barge tied to the structure. A long conveyor belt ran from the cement structure to land. A series of piers stood between the structure and land and served as a foundation for a conveyor belt that transferred the products to land. The small round pier shown in the photo is the only one remaining. Unfortunately the building boom ended and the facility was abandoned in 1922. 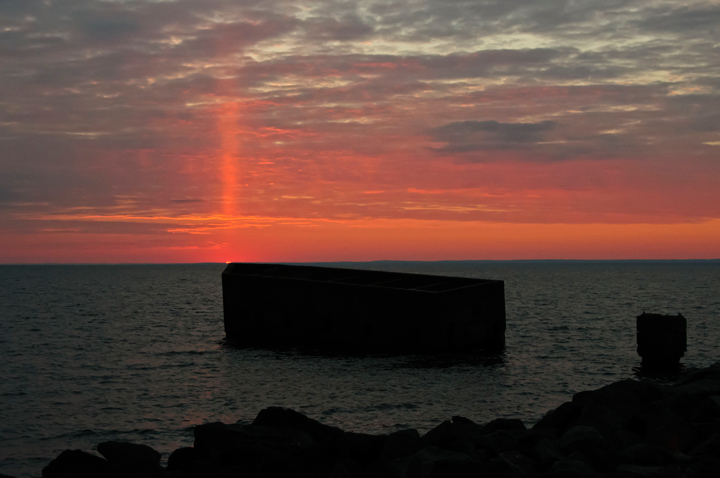 The breakwater was never built and the facility could not withstand the violent storms of Lake Superior. Today the Cribs are mainly used by swimmers, divers and nesting ducks. 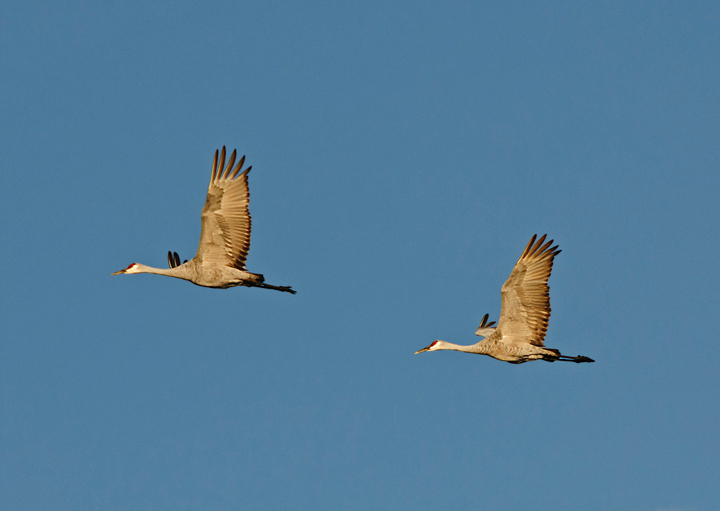 Fall means the migration of Sandhill Cranes is underway at Crex Meadows near Grantsburg, Wisconsin. 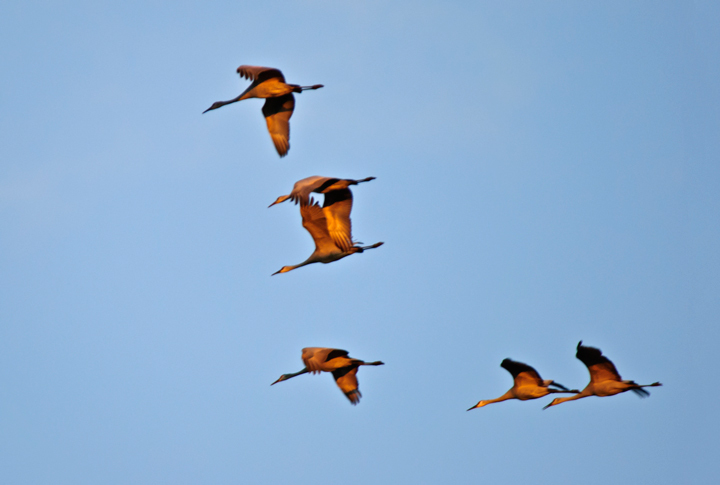 Thousands of Sandhill Cranes can be found at any one time around Grantsburg. About an hour before sunset they all start returning to Crex Meadows to roost. 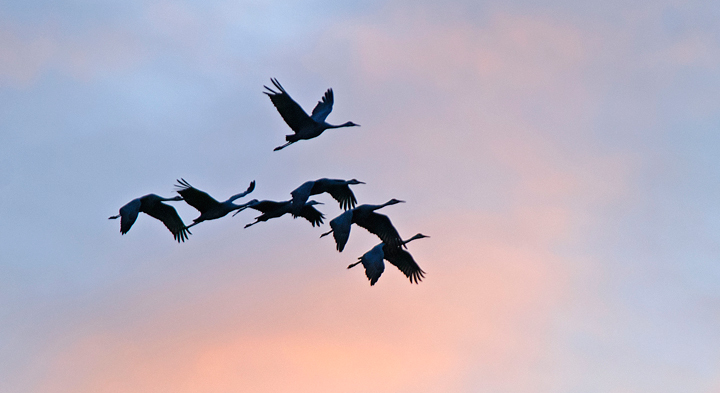 It’s an amazing sight with wave after wave of them flying over until well after sunset. 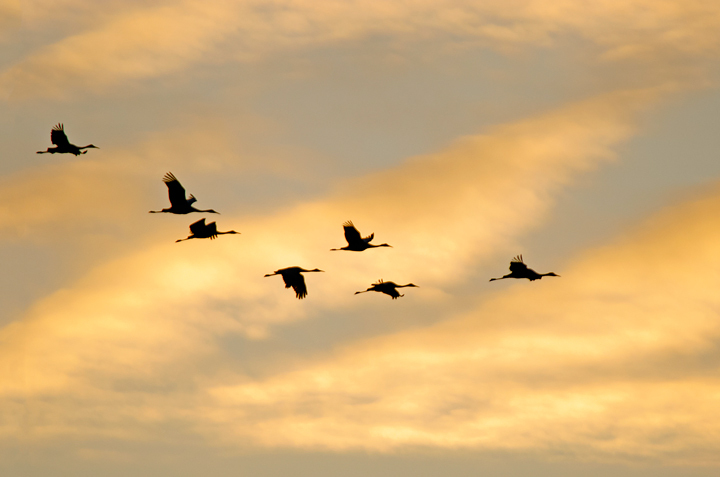 I made my first visit this year a few weeks ago to capture this year’s migration. 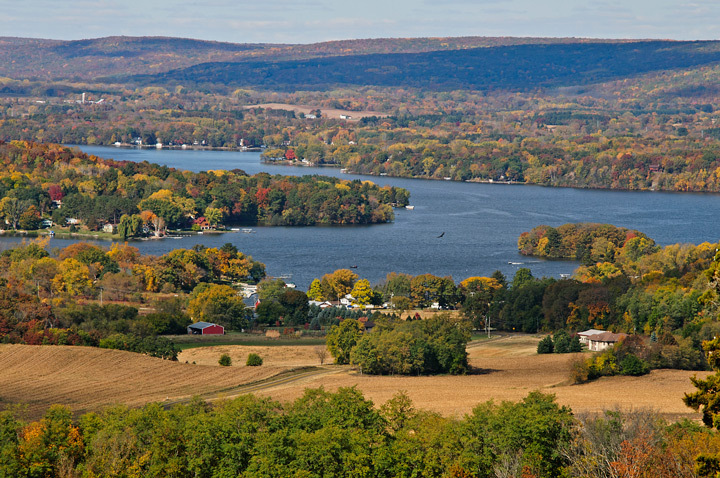 Earlier this fall we were in the Madison, Wisconsin Area to visit son who is a student and the University of Wisconsin. He also coaches soccer in Middleton, Wisconsin. We took in a couple of the soccer games that he was coaching and the next morning headed over to Gibraltar Rock State Natural Area. 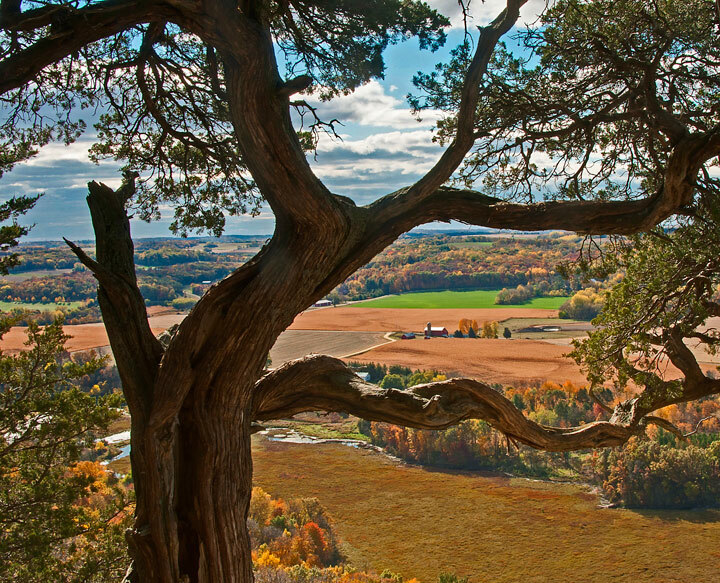 Gibraltar Rock is located near Lodi, Wisconsin. 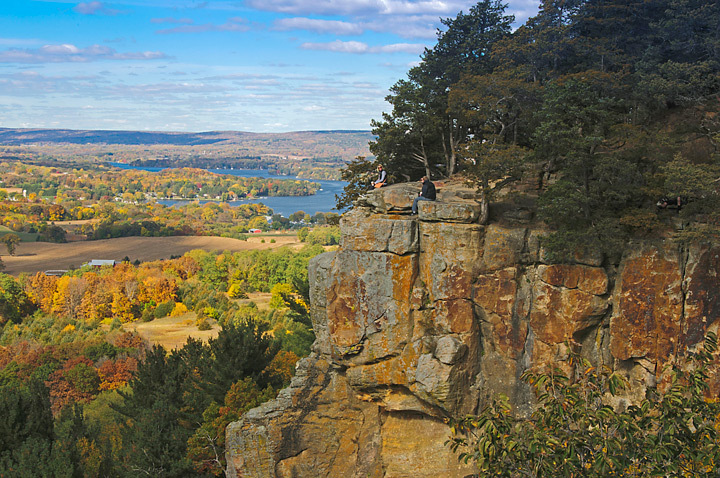 It rises 200 feet above the surrounding landscape and offers some great panoramic views of the Wisconsin River Valley and Lake Wisconsin. I’ve visited on a number of occasions but this is the first time I’ve visited in the morning when the light seems to be the best The trees are very interesting and provide some nice subjects for photography as does the river valley the unfolds below the rock. 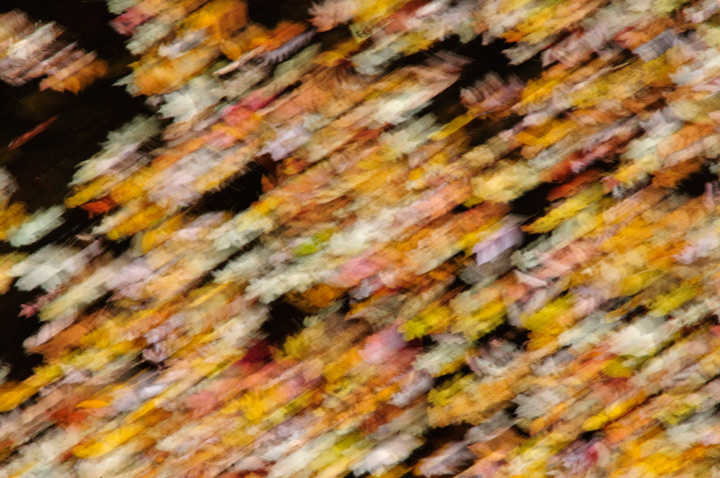 On this trip the trees were not in peak fall color but there were still some nice photographs to he had. As I’ve probably noted in earlier blogs I live on a farm in the middle of the woods. When we first purchased the farm it was surrounded by fields and I had a fairly good view of the sunrise and sunset. Over the years the open fields were converted to forest and the views gradually disappeared. Now I might get a glimpse of a sunrise or sunset but I’m not really able to enjoy it. 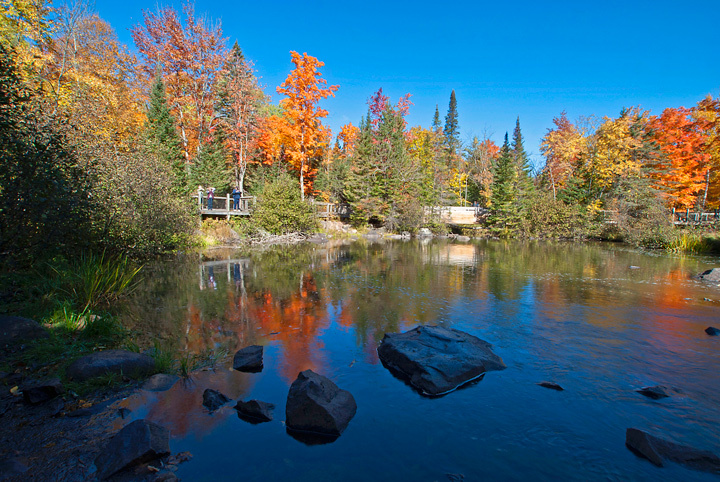 When we purchased our condo in Duluth, Minnesota that all changed. The condo looks northeast out over Lake Superior with a fantastic view of the sunrise. The last month has been great because I haven’t had to rise at 3:30 am to see the sunrise. We have been busy when we have been in Duluth so I haven’t been able to get a lot of photography in but I have been able to get a few shots in the morning before starting work on other projects. These are all shots from my balcony. 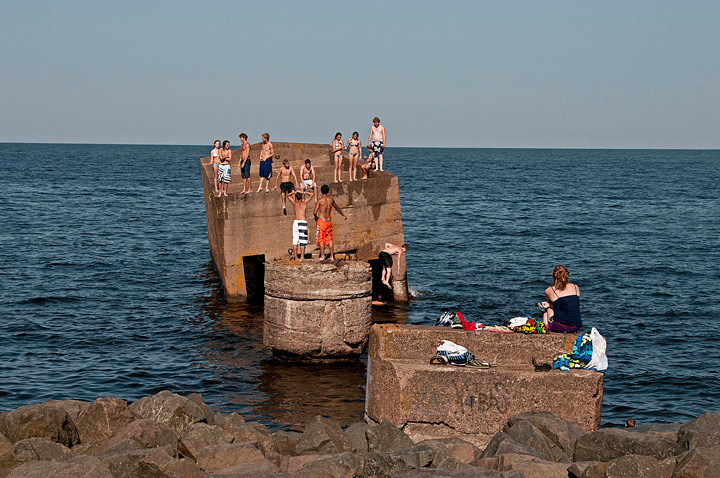 More Duluth photos can be found on my Website.